By the time Genet and other foreign journalists had arrived, the Lebanese right-wing Christian Phalange party had hastily buried most of the remains of their butchered victims, in an effort to prevent reporters from witnessing and broadcasting the carnage. In those early hours and days, the stark and blunt terror that the Phalange and their Israeli overseers visited upon the inhabitants of the camp, mostly Palestinian, had not yet been unmasked or imprinted into historical record. Despite the attempted cover-up of mass grave sites and the indiscriminate, execution-style slayings of more than 2,000 men, women and children — at least three axed out of their mothers’ wombs — the massacre caused the outcry the Israelis and their Phalange proxies wished to avoid. I felt compelled to visit Shatila Camp and its neighboring community Sabra 25 years after the massacre in order to undertake my own “walking through.” I relate the attempted erasure of the massacre by its perpetrators to the continuance of daily life in the camp and impunity for the criminals a quarter of a century later. When I first entered the camp I went searching for tributes, monuments, or cenotaphs (empty tombs for the bodies of the disappeared). I found none. What initially caused me anxiety, however, turned to recognition of the strange logic of monumentalizing catastrophe. It has been said that memorials and museums are built to alleviate historical amnesia in modern society: a people that risk forgetting needs to construct physical monuments to remind itself of its own history. In Shatila there are no monuments. No one has forgotten. The only accessible mass burial site is the unmarked Martyrs’ Square. The small encampment has become a makeshift graveyard for those murdered before their names could be recorded. Nearly all were killed without identification papers on their bodies, their corpses disintegrated beyond recognition. The red-earthed graveyard is surrounded by weeds and white roses, a sparse and haunting reminder of an event that time was supposed to forget. 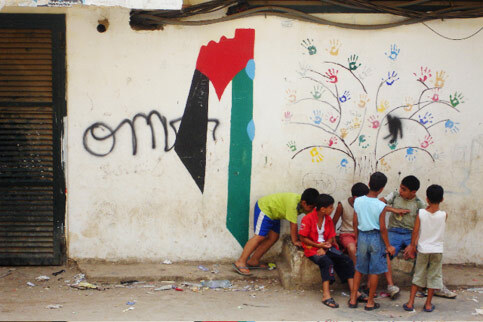 What Shatila Camp eschews in monument form, it makes up for in living history, because the heart of the camp is its children. Descendents of the survivors of the massacre, they are reminders of the tenacity to lead normal lives in the aftermath. A “normal” life for Palestinians in the camp means subjugation to economic pressures — no thanks to the unbearable policies of the Lebanese government — and harsh spatial confines that stifle adults and kids alike. Even though they suffer from a lack of consistent education, and live in an overcrowded physical space, the children prolifically produce art, photography, and theater at the Children and Youth Centre. Abeer, an administrator of the program, walked me and a colleague through a sizeable arts and theater space, and an exhibit area where the children’s photographs were on display. A simultaneous film project inclusive of the children was in progress. Living history for Palestinians and Lebanese in the camp has meant consciously holding on to the legacy, but for the perpetrators of the massacre, it has meant getting away with their crimes with blind impunity. The day of my visit coincided with the by-election for Rafiq Hariri’s seat between Phalangist Amine Gemayel and Gen. Michel Aoun’s party in the Mount Lebanon Metn region. Gemayel was the son of the founder of the Phalange party and its leader in the aftermath of the massacre. After his brother Bachir’s assassination, he succeeded him as leader of the Phalange and President of Lebanon. There is some small consolation in the fact that in this year’s election he was defeated in his own district. But the shuttered windows and closed streets of Beirut revealed the context of an electoral process whose tactics strong-arm the population into acquiescence with its supposed “security” aims. Today, Israeli Prime Minister Ehud Olmert’s government continues the tradition of claiming “peace-seeking” missions for Israel while collaborating with its old allies in war crimes. Calling on the services of its 1980s proxy death squad leaders in Lebanon, Olmert’s government recently consulted Antoine Lahad in its war on Lebanon. Lahad was leader of the South Lebanese Army from 1984-2000, whose forces heavily engaged in the butchering of civilians. The question begs to be asked, however, why the mightiest army of the Middle East is reduced to seeking the advice of a retired army general currently running a pub in Tel Aviv. It is certain that the devastating legacy of Shatila has palpably and irrevocably marked the historical and contemporary crisis of Palestinian refugees: foremost as victims of Israeli expulsion, and subsequently as dehumanized inhabitants of Lebanon and targets of Israel’s proxy war there. The event is permanently entrenched in the larger fabric of Palestinian dispossession, but the choice of the world community remains open: whether it will choose memory for amnesia, and justice for impunity. Maryam Monalisa Gharavi is a doctoral candidate in Comparative Literature at Harvard University. She has contributed poetry and critical writing to various publications, and has written and directed experimental documentary films. She has worked in collective solidarity action on the Israeli occupation in Palestine for seven years. She made trips to refugee camps in Lebanon in Summer 2007.